On December 31, 2017, 11 minutes before midnight, with one can of Sapporo left in the fridge, I decided to quit drinking alcohol for one year. Why, you ask? Well I’ll get to that, but first let me tell you about my addiction. I have one addiction. To ramen. No surprise there right? But for most of my adult life, I also enjoyed drinking a few (to many) beers after work to de-stress from my busy workload, even if it meant just zoning out with a six-pack alone on the couch at the end of a long day. It sort of kept me alive. In all those years, never did I imagine I would (or could for that matter) give up drinking. The cycle was always work hard, drink beer, sleep it off, work hard, drink beer, forget to sleep, work hard, drink shochu–day after day after day. Then, a few things happened on that New Year’s Eve. While watching the events leading up to the countdown on television, my 3-year-old daughter slipped while dancing around the living room and fell face-flat onto the hardwood floor, resulting in cuts on both lips. Her face bloodied and screaming uncontrollably, my wife and I panicked. At this time I was already 6 or 7 beers in and even if I felt sober there was no way for me to get in a car and drive her to the emergency room. Fortunately, the cuts were minor and she was able to fall asleep that night without any long-lasting injuries. For me, I felt useless. I needed to be more responsible as a parent. I needed to be more responsible as a husband. I needed to be more responsible as a friend, as well as, a boss. So I accepted the challenge and left that last can of Sapporo in the fridge. At first, my friends thought I was crazy. They knew me and they all thought it was some kind of joke. But I’m a pretty stubborn scorpio/snake so I knew, and they soon realized, that this was a serious goal. Another motivational force, was trying to operate and manage three different businesses primarily on my own. I felt that 2018 would be the year that needed 100% of my focus: Full control of my vision and a level-headed direction of resources. All this said, 2018 was filled with never-ending drama. If there was ever a year that I should have been drinking, this was the year. I resisted. For the most part, I navigated and parsed out all of the negativity and fought each battle one day at a time. Then September came and October-November became almost unbearable. Honestly, it was a struggle. After deciding to apply for life insurance, a routine blood test resulted in an abnormality in my liver. At first, my doctor brushed it off as maybe too much alcohol intake in recent days, but NO! I hadn’t had a drop of alcohol in nine months! So she ordered a bunch of tests and I spent the majority of October and November trying to juggle work, family, doctor visits, and more work, including spending a majority of my 41st birthday (one day before the start of Rajuku NY) in an exam room being prodded and pricked like an expectant mother. As of this writing, every other test has come back normal and it is still a mystery as to why the abnormality still exists. It could be a myriad of things and we’ll just have to keep checking one test at a time, one day at a time. For now, I feel as healthy as a 20-year-old and I can’t wait to keep building my ramen dream. My decision to quit drinking was never for health reasons, but ironically maybe it really was. If I hadn’t have quit, perhaps my health could have gotten a lot worse. One year without drinking may have been the best decision of my life. One year to get more years. It sort of kept me alive. And here we are today, December 31, 2018. I’ve accomplished my goal: One year without any alcohol. I’ve worked harder than I’ve ever worked this year and there will be no slowing down from here on out. In 2019, I will need to work even harder. Many of you, including myself, were looking forward to raising a glass together, but it looks like I’ll be keeping that last can of Sapporo in the fridge a little bit longer. One addiction is more than enough. Cheers to 2019. Let’s make it a good one. Ramen Shack on the local news!! Last week, for the fun of it, I started to reduce a shoyu mixture to copy a technique that is common in soba flavorings. Little did I know that blending it with my shoyu tare and chicken soup would trigger a memory of a bowl I once had. The deep shoyu-colored broth and dark staining of the noodles reminded me of a familiar Toyama Black style with hints of Shinpukusaikan. So I spent a week trying to perfect it. It’s still not perfect but it is definitely a bowl that appeared from my soul. I hope you like it. Beginning Monday September 17, 2018. Some might say my menu is too big, but I say it still needs to be bigger. 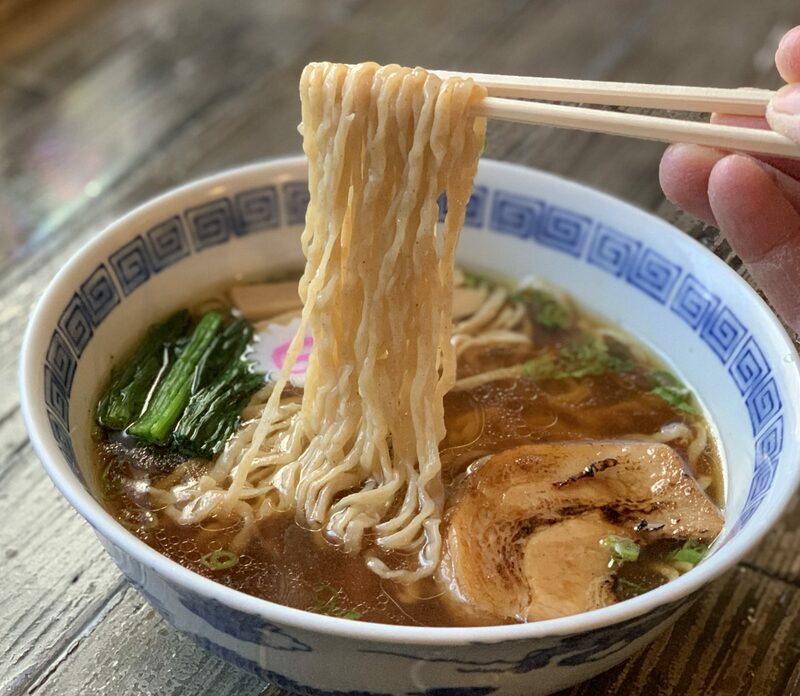 First and foremost, I am a fan of ramen and I like to copy styles that I’ve tried in the past–mostly the styles we can’t get here in New York. Hate it or love it, you’ll always have something else to come back and try. On the new B-side will be the weekday specials. Tsukemen Tuesdays and Iekei Wednesdays have played a special role for awhile now so I thought I’d challenge myself and have a special bowl for everyday of the week (excluding weekends but who knows?? I may have leftovers). This is going to be fun. Forgive me if we crash and burn. Haha. We made it! Slowly, we will get bigger and better. It’s not easy running 3 different companies at the same time but all 3 are necessary for my vision. Fear of failure is always imminent (for I have failed on many occasions), though I’ve always seemed to struggle for the right reasons with some force of luck managing to pick me up. I still don’t know what the future holds, but it’s there…I feel it. For years, Ramen Burger has been my prize creation. For years, Ramen Burger has been its own dominant force in the summer. For years, Ramen Burger’s dominance would dissipate in the winter. For years, FIVE years, we waited for it to be summer. They said we needed to act fast and cash in on the attention. I said we needed to be more patient and build a foundation. They said the hype was luck and would die fast and short. I said the hype was bred to live slow and long. We missed out on opportunity. We didn’t act fast enough. We let them copy us. We are the losers. I am still here. I put in 80 hours when everyone else was putting in 40. I tried to stay true to my prophecy. Yet, I am not a success and still one step from failure. But for what it’s worth, Ramen Shack has become the perfect complement to Ramen Burger. As I had imagined it would. Five years later, Ramen Shack has matched the monthly sales of Ramen Burger, albeit in the middle of summer. Yes Ramen Shack is open more days and 50 times more work to maintain, but inside I feel like we are finally making progress. I can’t wait for it to be winter. The Ramen Shop recipe encapsulates all other recipes. It’s not just about the food. It’s not just about the people. It’s not just about the ambiance. It’s all of these arranged in a consistent fashion that makes a ramen shop THAT ramen shop. When I was living in Tokyo, I used to live near a very average ramen shop that had been around a very long time and because it was literally 30 seconds from my home I found myself eating there way too often. Somedays, I would even go in my pajamas and the friendly staff would always be there to welcome me. It was my comfort when I was happy, my comfort when I was sad, and my comfort when I just needed to see a friendly face. The ramen wasn’t great, but the shop itself was one of my favorites. Then one day, I stepped in and there was no one there to greet me. Strange music playing in the background. No sense of comfort. After seating myself I was finally brought a menu by someone I had never seen before. The menu was the same. The ramen may have been the same, but nothing felt right. I felt lost. The bowl was sloppy. The taste was salty. There was way too much vinegar. The temperature wasn’t scolding hot. The ac was damaged. The smell of cigarette smoke was still lingering. The floor was sticky . The newspaper on the table next to me was more than a week old. The pitcher of water had no ice. The tissue box was empty. Where was I? I went back a few more times and each time just wasn’t what it used to be. I decided to stop going, not because of the food (the food was never that great anyway), but because my comfort had suddenly become my pain. I stopped craving it. I yearned for something else. I began to move on. Two years after I moved away, I found myself in the neighborhood and decided to pass by. The ramen shop was gone. The entire building was gone. In its place was someone’s brand new modern house with a bmw parked in its garage. I began to crave the bowl that once was. The one that was etched in my memory. The one that wasn’t very good but came with a smiling face. The one that got me out of bed after fighting a 4-day flu. The one that was sloppy, salty, sour, and lukewarm. The one where the ac never worked. The one where cigarette smoke lingered heavily. The one with the sticky floor. The one with the week-old newspaper. The one with the ice-less pitcher of water. The one that was never the one in the first place. I missed the one as it used to be whole. I really needed that tissue. The ramen shop recipe had been broken, never to be fixed again.